How do I customise Quick access? 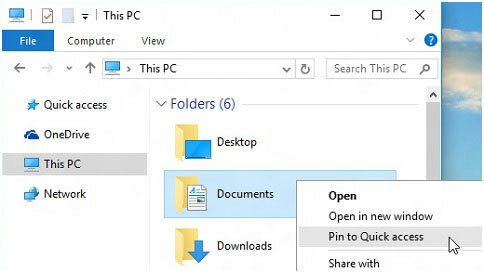 If you want a folder to show up in Quick access, right-click it and select Pin to Quick access. Unpin it when you don’t need it there anymore. How does OneDrive work in Windows 10? OneDrive is free online storage that comes with your Microsoft account. Save your files there and you’ll be able to get to them from any PC, tablet, or phone. If you’re looking for something else, have a look at other File Explorer topics. 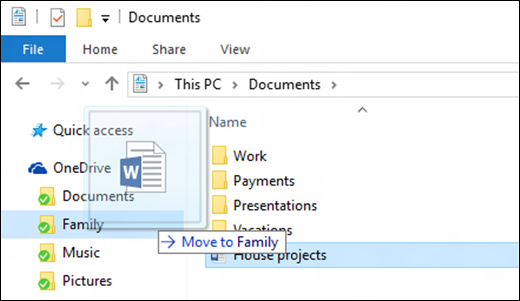 To show libraries in File Explorer, select the View tab, and then select Navigation pane > Show libraries. 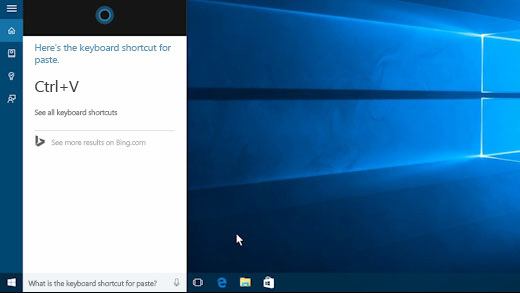 Enter a question or keyword in the search box and you’ll get answers from Microsoft, the web and Cortana. I upgraded to Windows 10 from XP. How can I retrieve my files that are now password-locked from me? I signed into XP with a password – no MSN account needed. Now I need an MSN account and a code to log onto my computer. The files are looking for the ‘me’ they used to know. When I try to open my files, I am denied access. how to keep “this pc” from file explorer from starting up when I logon? Please, I need some help! I can´t open my PDF files since yesterday. Does that have to do with updating my PC with Windows 10? What a pity! How do I project images from a USB pen drive through a connected projector? where can I find my recycle bin? Can’t find what I want, haven’t found how to put attachments to e-mail, haven’t understood how to do almost anything with Windows 10. Just another botched attempt to sell more operating systems under the guise of making things easier! They could have left “98′, XP, Vista, “Windows 7”, Windows 8, and 8.1 Alone. But then they wouldn’t make some more money! It takes me forever to learn each new system, but each is progressively harder. “10” is the worse yet. Thanks, Microsoft! My printer is showing offline, how do I change it. SINCE I MOVE TO WINDOWS 10, I HAVE A PROBLEM WHITH FILE EXPLORER. WHEN I AM LOOKING INTO MY FILES, SCROLLING DOWN, SUDDENLY IT JUMPS TO THE TOP, AND I HAVE TO START OVER, AND OVER AND OVER AGAIN. PLEASE TELL ME HOW TO FIX THIS. I have downloaded pictures from facebook and now can’t access them from my picture file. Please help…comment given file cannot be opened. Is there any other way to save them where they can’t be moved? The file browser in Windows 10 does not work. When I ask to know the amount of file, folders and bits that has a UNIT, I get different amounts, in some cases, a lot different. The question I ask is by consulting the properties. And the quantities can be very different depending on how you click on a drive, a folder, or a subfolder, or a set of folders and files. I have marked the option: “Allows the creation of content index of the files of this unit in addition to the properties of the file”. Next Next post: how do i sync my settings in windows 10?